Born on April 13, 1906, Samuel Beckett was the son of a Dublin, Ireland surveyor and nurse, the second son of the couple. As a boy he attended a local playschool and then attended Earlsfort House School in the center of the city. In 1919 he was sent to Portora Royal School in Enniskillen, County Fermanagh (where Oscar Wilde also went to school). The young Beckett excelled at cricket, later playing for Dublin University. 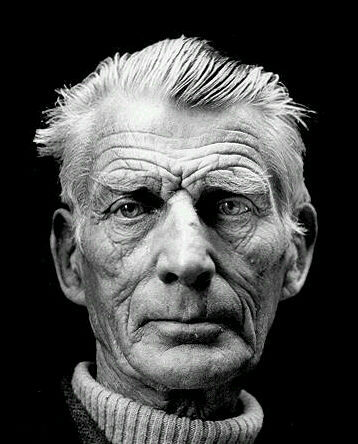 From 1923-1927 Beckett attended Trinity College in Dublin, graduating with a B. A. degree. He briefly taught at Campbell College in Belfast before taking the post of lecteur d’anglais in the École Supéerieure in Paris. There he met James Joyce, later working with him on research for the book that became Finnegans Wake. Beckett’s first published work was a critical essays defending Joyce’s work and method, “Dante…Bruno…Vico…Joyce,” which was published in Our Exagmination Round His Factification for Incamination of Work in Progress, a book of essays on Joyce with other contributions by Eugene Jolas, Robert McAlmon, and William Carlos Williams. The two men’s relationship turned sour, however, when Beckett rejected the advances of Joyce’s daughter, Lucia, suffering from progressing schizophrenia. Beckett’s first story, “Assumption” was published in Jolas’ transition, and the following year his poem Whoroscope won a literary award selected by Nancy Cunard and Robert McAlmon and published by Nancy Cunard’s Hours Press. In 1930, the author returned as a lecturer to Trinity College, but he soon became unhappy with the post, inventing a figure, Jean du Chas, the supposed founder of Concentrism, and writing an essay (as fiction) for the Modern Language Society of Dublin. He resigned his post in 1931, ending his academic career. He traveled to Europe, spending some time in London, where he published is critical work, Proust, In 1932, he wrote his first novel, Dream of Fair to Middling Women, and two years later published his first collection of short stories, More Pricks Than Kicks. The same year he published his second book of poetry, Echo’s Bones and Other Precipitates while also working on the novel Murphy, published in 1938, and a year later returned, frustrated with his life in Ireland, he settled permanently in Paris. In January of 1938 Beckett was stabbed in the chest and nearly killed, becoming a friend of his lifelong companion, Suzanne Dechevaux-Dumesnil, when she visited him in the hospital. During World War II Beckett joined the French Resistance, working as a courier, and on several occasions was nearly caught by the Gestapo. After his unit was betrayed in 1942, he and Suzanne fled on foot to the south of France, living in a small village, Roussillon, storing arms in his back yard to assist the Resistance. Upon war’s end, he was awarded the Croix de guerre and the Médaille de la Résistance by the French government for his wartime efforts. At Roussillon he worked in a novel, Watt, but did not publish the book until 1953. After a kind of revelation on a visit to Dublin in 1945, Beckett suddenly realized the kind of work he wanted to create, returning to Paris and over the next many years writing numerous fictions, plays, and performative works, among them Waiting for Godot, Molloy, Malone Dies, The Unnameable, Endgame, Krapp’s Last Tape, and Play. In 1961 Beckett won, with Jorge Luis Borges, the International Publishers’ Formentor Prize in recognition of his entire body of work. In 1969 he was awarded the Nobel Prize in Literature. Although the author is far better known for his fiction and drama than for his poetry, many of works, like Stein and Joyce before him, might be read as poetry, and all certainly contain a high level of poetic writing. Today Beckett is recognized as one of the greatest writers of the 20th Century.